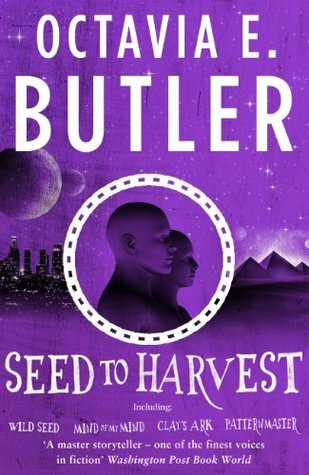 Seed to Harvest is a series of four novels, collected together in one volume. The third book is essentially a standalone novel, while the fourth ties it and the first two books together. The novels start with the meeting of two virtually immortal people, a long time ago (18th century, I think) in Africa. One is Doro, a man whose soul travels into other bodies (and whose previous host bodies die / are discarded). The other is Anyanwu, a woman who has near-infinite abilities to heal her own body, and read her own DNA, understand what each cell is doing, and how to heal / regenerate / rejuvenate herself. Doro is much older - thousands of years older - and has been breeding people with supernatural powers into little (quite incestuous) communities in order to cultivate their supernatural traits. He decides to conquer and control Anyanwu, and the first novel is essentially about the relationship between them. The second novel, set in the 1970s or so, is about a young woman who is the most powerful result of Doro's breeding programme, and who becomes a power to contend with. The third novel is about an invasion by an alien parasitical micro-organism which changes the physical properties of the humans it infects, and permanently alters their offspring. The fourth novel is about people from the breeding programme, and their power struggles, while in a world-wide war with the people who are infected with the alien organism. Humans without superpowers have become nothing more than slaves. Reading these novels, it becomes very clear what themes interest Octavia E. Butler: power, control over others, the mechanisms of slavery. Every single one of the books is about people imposing their own will and control on others, with motives that range from mean-spirited and petty to survival instinct, from lust for power to a desire to protect humanity or protect family. In essence, these are all novels about enslavers and the enslaved. Unfortunately, the novels aren't nearly as gripping and powerful as Kindred (by the same author), which doesn't bother to metaphorise slavery into supernatural fantasy, but simply transposes a modern couple into the past through time travel. Kindred is a masterpiece. Seed to Harvest is comparatively weaker, because none of the characters are entirely human. Super-powered people using super-powers to enslave are less scary than men using mundane brutality. The fantasy elements create a distance between subject matter and impact on (this) reader's empathy. I must also admit that I did not really find Anyanwu's character convincingly developed after the first book - I think her story in the second book was wasteful and disappointing. I'd still recommend the author highly - but I'm really glad I read Kindred first: it's a much, much better novel than this series.